When I started Punchbowl, I read a formative book called “Blue Ocean Strategy.” The essence of the book is that when you enter a new market as a startup, you should seek new markets or niche customer segments that you can claim for yourself. If you try and compete head to head with your competition, you will find yourself in a bloody battle for survival (e.g. a “red ocean”). The goal is to make the competition irrelevant and create and capture new demand. For the first 7 years of Punchbowl, this was our strategy and it has been successful. While many companies have entered our space, there are only a few that remain. It’s amusing to think about all of the companies that got so much press only to fizzle out a few years later: Renkoo, Skobee, Pingg, Cocodot, Crush3r, Planypus, Socializr (acquired by Punchbowl) and many, many more. Heck, even Microsoft entered the market at one point. We remained steadfast to our approach, and carved a sizable chunk of the market as our own. Our customers love us, and our business is strong. At some point in your company’s lifecycle, you’ll build a bigger, more defendable “moat” around your business. Your moat may come from your customer base, your partners, your technology, your team or the strength and success of your business model. And at that point — and only at that point — it is time to take on your competition head to head. For Punchbowl, October 20th, 2014 is that day. Today we are announcing a brand new, stunning user interface and an invitation collection called “Characters Kids Love.” This is the result of months of work, and we’re excited to unveil it. 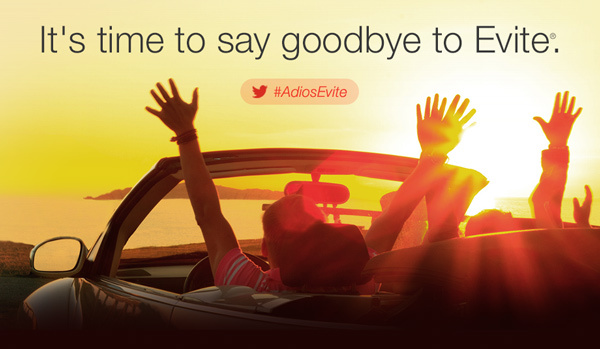 But more importantly, today is the day where we are publicly stating that it is time for the world to say goodbye to Evite. We want to own the entire market, and we believe we have the product, team, and business model to make it happen. We’ve orchestrated an exciting, impressive launch for today, which includes traditional press, print ad placements, digital ad placements, and a coordinated social media campaign. We’re taking on our competition head to head, and we’re excited to see the results. Evite is an Internet dinosaur that should be extinct. Our campaign will help the world know that there is a better alternative. The next chapter is yet to be written, but we know how we want the story to end. We want to beat Evite and become a household brand for online invitations. KEY TAKEAWAY: Startups should enter an existing market using “Blue Ocean Strategy,” but pivot to direct head to head competition once they have built a moat around their business. That’s the blueprint to beating your competition. Should I Write a Business Plan?